I had some free time in August and decided to go to Canada. I’ve wanted to visit Nova Scotia for quite some time now and had just never pulled the trigger. Pesky obstacles like time and not having a car always seemed to stand in the way. But this year, things are different. I’ve already been in 35 states, Costa Rica and Mexico this year. Why not go to Canada and continue the vagabond, North American tramping of 2014? The only reasons I could find were: 1) I can’t afford another for fun, solitary road trip. They always cost more than I think they will. 2) I should probably dedicate some serious time for booking future shows, as the schedule is a bit light for the fall after such a busy summer. All those reasons were lame so I got in my car and headed north to beat the brutal heat of late August in Virginia. After a better than expected drive through the north east, I arrived in New Brunswick, Canada on a cloudy Thursday morning. My first mission was to find a place to camp. I had found a spot on the internets called Shine Campground that was apparently a free campground right by The Bay Of Fundy National Park. It was even more amazing than I expected. A wonderful man named Don and his son have set up a sweet little spot on their property for travelers and locals to camp and enjoy the wonderful scenery of their Province. There was plenty of soft grass for tents, a sweet fire pit with plenty of available wood and bench swings surrounding it, and a great view of the wetlands to sit and ruminate your existence while watching birds and hoping to see some moose. I couldn’t imagine a better spot to call home base for a few nights. 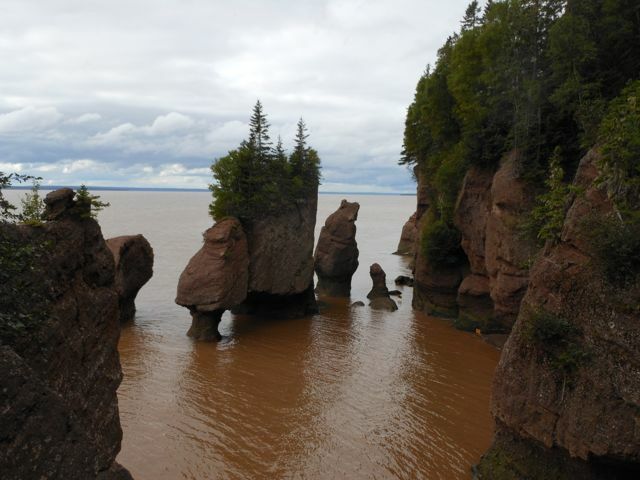 I then went to The Bay Of Fundy National Park. I didn’t know much about the Bay Of Fundy before arriving on its shores. It is famous for its extreme tides. In a six hour span, the tide rises between 34 to 55 feet, depending on factors such as season and moon position, and then spends six hours falling back away. When I was there, it was rather tame, only rising 37 feet. That’s about a foot every 10 minutes. It was crazy. I literally sat there and watched every third or fourth wave go further than the previous one. I’d never seen anything like it. 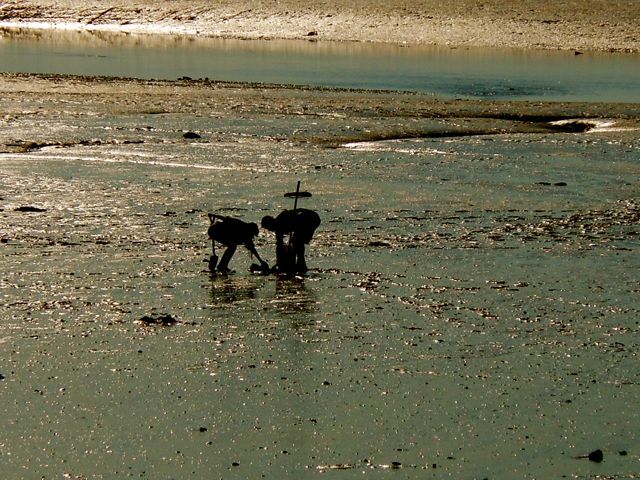 And when the tide recedes to its lower level, mud flats stretching for hundreds of yards (or meters, if you’re into that sort of thing) appear, and folks go out to slide around in this slippery playground, or to dig for clams, as pictured above. Quite the sight. I went on a couple of sweet hikes along the bay and into its surrounding hills, seeing abandoned mines and clouds of sand pipers and a ton of frogs of different shapes and sizes. Pretty awesome, no doubt. But I was very disappointed in the park as a whole because that’s really all it had to offer. It had no other hiking trails. Nothing more really to do at all. Lame. After a gazing upon its greatness for a couple of hours, I traveled on. I made my way down to Nova Scotia after paying a lot more for gas than I had intended. That junks be expensive up there. It came to about 5.50 per gallon. And yes, it took me quite some time to figure that out. Liters to gallons and exchange rate and such. I’m still not totally sure that number is correct. But I think it is. Anyway, Nova Scotia is awesome. The portion of the province that I visited is very sparsely populated, with only a handful of small towns spread about. 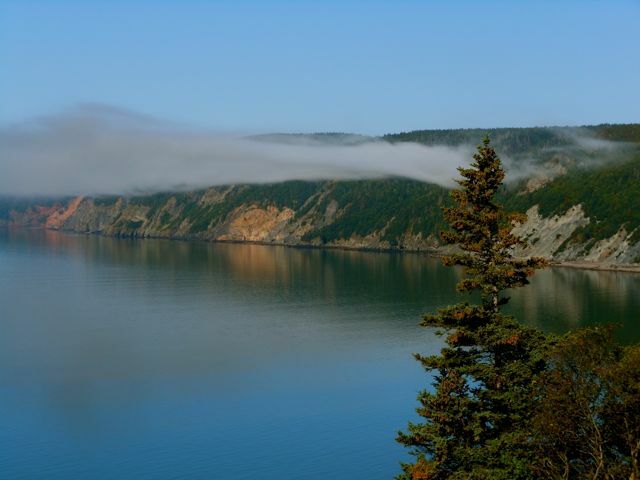 I mostly drove along the coast of bay surrounded by beautiful red spruce forests and nary another car to be seen. In an effort to get even further off the beaten path, I made a turn down an unmarked dirt road that wound me down the cliffs directly to the coast, with signs warning me to not drive on the road because it is under water during portions of the day when conditions are right. After a nice picnic in the wilderness, with the tide rapidly creeping closer to the road, threatening to constrict my exit, I headed back up the cliffs and made my way to Chignecto Provincial Park. Now this park, unlike that stupid New Brunswick one, was free to enter and enjoy. I went on an awe inspiring hike through some amazing woods and then down along the beach to complete the loop. I spent a couple more days in Canada after that. But I’m getting tired of typing and I assume you are getting tired of reading. When I crossed the border back to the States, I got hassled pretty good. That guy sucked. On the way back south I hit up Acadia National Park in Maine and the White Mountains in New Hampshire. It was a great trip seeing some things I’ve never seen before. I also met some great folks up in Canada that I can only hope I will cross paths with again some day.